U.S. stocks advanced all five days to cap their strongest weekly performance in five years. The S&P 500 finished the week above its 50-day moving average for the first time since the 10.1% correction the prior week and is now down less than 5% from its January 26 all-time high. Wall Street gave back stronger intra-day gains on Friday as investors assessed implications of new federal indictments related to Russian meddling both before and after the 2016 U.S. presidential election. The news served as a distraction for investors, who were otherwise focused on the credit markets and the outlook for interest rates as economic growth accelerates. Meanwhile, concerns over a more aggressive Federal Reserve response to rising inflation subsided after a report showed January retail sales fell 0.3%, the largest decline since February 2017. For the week, the S&P 500 advanced +4.37%, finishing above 2,700 for the first time since February 2, the Dow Industrials climbed +4.25% to retake the 25,000 level, and the MSCI EAFE (developed international) rose +4.27%. January's Consumer Price Index (CPI) data showed signs of growing inflationary pressures. 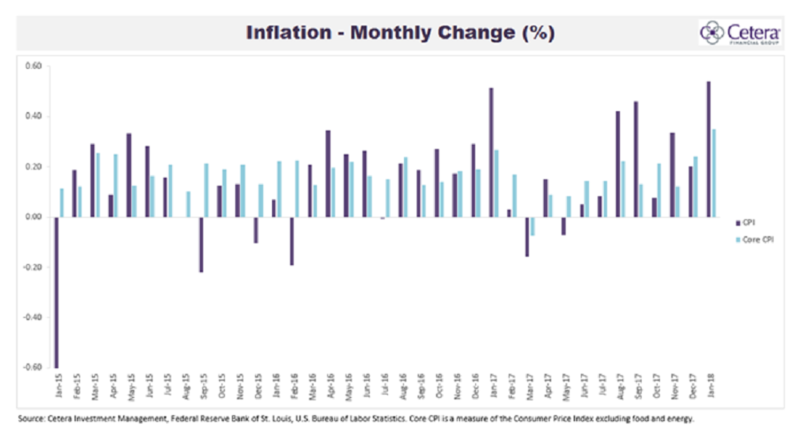 As Chart 1 illustrates, the CPI inflation measure held steady at 2.1% on a year-over-year (YoY) basis, but the monthly figure had a sizeable increase compared to December. The CPI increased by 0.54% in January, which is the highest monthly increase since 2013. The less volatile core CPI, which excludes food and energy costs, also posted a large 0.35% January increase, the highest since 2005. Over the last month, there has been a pickup in other inflation-related readings as well, including average hourly earnings and the producer price index (PPI). The threat of increased inflation has driven bond yields higher, resulting in weak bond performance year-to-date. Moreover, the Federal Reserve may get more aggressive raising interest rates in order to slow inflation's growth. The rise in rates and possibility of increased Fed tightening has caused higher volatility in the equity markets this month. We are not expecting a major uptick in inflation, but a moderate increase. In times of rising inflation, investors should stay diversified across asset classes, and keep below-benchmark duration risk in fixed income.